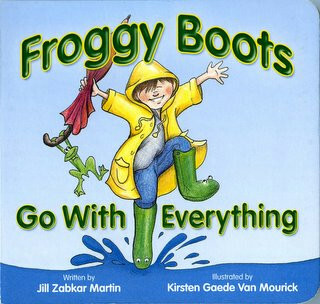 Everead: Froggy Boots Go with Everything! This cute little board book was sent to me in the mail a couple of months ago. I think a lot of parents can relate to the child who wears one article of clothing until they can't possibly squeeze their body into it anymore, until it totally falls apart, or until it "mysteriously" disappears in the laundry ... For my older brother, it was a flannel grey-and-black-checkered jacket. He's wearing it in at least one of his school pictures. Wouldn't take his jacket off for the camera guy. For me, it was a pink dress-up dress. I have pictures of myself kneading bread, trick-or-treating, babysitting, dancing, you name it, in that pink dress. My littlest brother practically slept in his cowboy boots. So the premise of Froggy Boots Go with Everything is charming in its familiarity. A little boy jumps in puddles, takes a bath, and plays on the monkey bars in his rubber froggy boots. Added to the fun of the book is the little guide at the end that has you look for the real frog hiding in each illustration as well as other cute hidden objects. My boys, so far, haven't become overly attached to any one article of clothing, but I would not be surprised if one day, this book becomes both fun and applicable to them as well. My boys would love this! They have froggy boots.